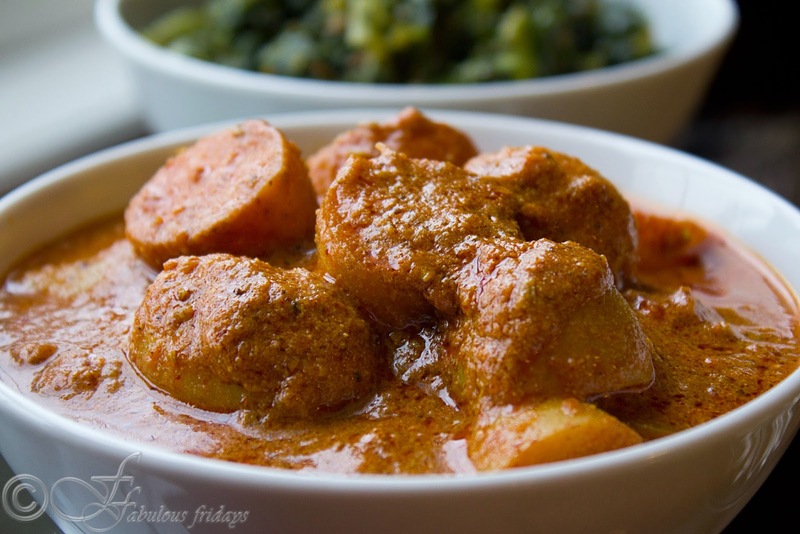 Dum Aloo or the fried potato curry is an Indian dish from the Kashmiri kitchen. On yagyopavit, the sacred thread ceremony, dum aloo and dal are served with rice. Crisp, tangy, delicious and spicy I like it with roti or naan. Dum aloo can be served on special occasions and looks as beautiful as it tastes. Today I served the stir fry broccoli and green beans preparation to complete the meal. Boil the potatoes till they are about three quarter way cooked. You can peel them if you want, I like to keep the skin on. Prick them all over with a fork and rub a bit of salt and Kashmiri chili powder all over them. Heat oil in a pan and fry the potatoes till crisp and golden brown. Drain excess oil and keep aside. In the left over oil, add bay leaf and all other crushed dry spices and stir for about 10 seconds making sure they do not burn. Add onion-ginger-garlic paste and fry on medium high heat stirring constantly till the mix becomes golden brown. Add ground ginger and yogurt and red chili mixture to the pan. Keep stirring as the mixture is very susceptible to burn at this point. Cook for about 2-3 minutes more. Now add the fried potatoes and reduce the heat to medium. Cook the potatoes in this mixture for about 3-4 minutes to allow the spices to seep into the potatoes. Cook until all liquid is almost dry and oil separates. Remove from flame and serve hot. If you are making this ahead of time and you see that the dish is very dry, add some boiling water to adjust the consistency. Wash both the veges and cut them into small 1/2 inch pieces. In a pan heat oil and add hing and cumin seeds. Let cook for 30 seconds. Add all the veges and stir well. Add all the dry spices and stir to coat the veges. Reduce heat to low and cover the pan. Let the veges cook covered on low heat for about 10-12 minutes. During this time open the lid every 4 minutes to stir them and to check if they are fully cooked.When the beans look fully done, remove from heat and serve hot.